Sometimes I see a dress, and I can’t wait to put the accessories and little details with it. 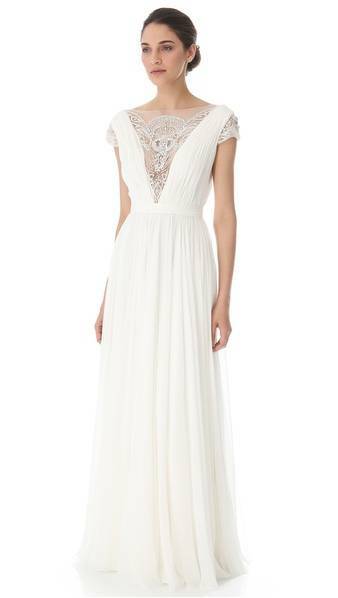 Then some days, I see a dress like this Reem Acra Goddess Gown with all sorts of ethereal goodness, and I just have to share it as a stand-alone dress. Look at that detail in the plunging neckline. Isn’t it like something out of a dream (or at least Downton Abbey)? Reem Acra always has the most gorgeous gowns, but this one really took my breath away. Have fun gazing at it! Below is a slideshow of more gorgeous Reem Acra gowns. New Wedding Dresses from Casablanca Bridal!